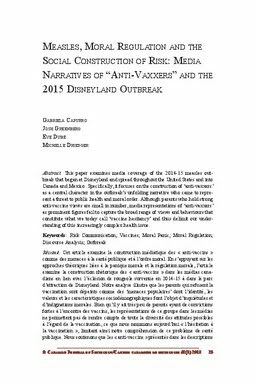 This paper examines media coverage of the 2014-15 measles outbreak that began at Disneyland and spread throughout the United States and into Canada and Mexico. Specifically, it focuses on the construction of ‘anti-vaxxers’ as a central character in the outbreak’s unfolding narrative who came to represent a threat to public health and moral order. Although parents who hold strong anti-vaccine views are small in number, media representations of ‘anti-vaxxers’ as prominent figures fail to capture the broad range of views and behaviours that constitute what we today call ‘vaccine hesitancy’ and thus delimit our understanding of this increasingly complex health issue. Capurro, Gabriela, Greenberg, J, Dubé, Eve, & Driedger, S. Michelle. (2018). Measles, Moral Regulation and the Social Construction of Risk: Media Narratives of “Anti-Vaxxers” and the 2015 Disneyland Outbreak. Canadian Journal of Sociology, 43(1), 25–48.